marked the final defeat of the Goths in Italy. The growing power of the popes in the fifth century led to inevitable conflict with the emperors of the Eastern Roman Empire, who had come to consider themselves virtually as rulers by divine right. These clashes between the temporal and spiritual powers had consequences for the city of Naples where there were moments of manifest tension between the ecclesiastical and civic authorities. The clash of interests calmed to some extent during the reign of the Ostrogoth, Theodoric, who despite favouring Papal power, helped improve the situation to such an extent that Pope John I was able to go on mission to Constantinople. The Neapolitan population looked to Rome for spiritual guidance and, despite suffering from the temporal-spiritual rift that was shaking Europe, the clerical element in the city appears to have distinguished itself in both the religious and cultural realms. It has even been argued that, if only by default, Naples was the cultural centre of Italy both during its period as a Byzantine Duchy and in the following period of autonomy. 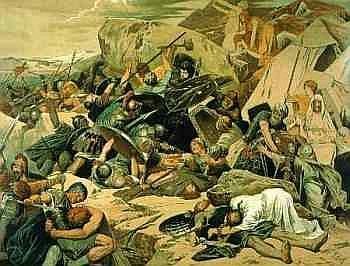 During the Gothic Wars, the city was controlled by a permanent garrison of Goths and ruled by a provincial government, and it was into this situation that the Greek general, Belisarius, was sent in 535 by the Eastern Emperor. Welcomed by the Sicilians, Belisarius encountered strong resistance in Naples and was only able to take the city by entering secretly though the city's aqueduct—possibly guided by traitors from within. His revenge on the city for having resisted was severe and was exacted on the Gothic, Neapolitan and Jewish populations. Such was the ferocity of his troops that he was even admonished by the Pope. Passing again for Naples on his way to fight the vandals in Africa, Belisarius prevented further sacking and pillaging, trying this time to help reorganise the city that he had so depopulated. He is even reputed to have brought back prisoners from his African campaign to help in its repopulation. Within the space of a few years, war came again to Naples. This time it was Totila who, having conquered Benevento, was now desirous of a port that would allow him control of the sea. He tried to take Naples by negotiation and, not surprisingly, found a long-suffering population willing to come to terms. The same could not be said for the occupying Byzantine garrison, composed of Isaurians, a warrior race/tribe from Asian Minor, seemingly controllable only by the Eastern Emperor. Naples again found itself besieged and, when the Castle of Cuma and the Greek fleet sent to relieve Naples both fell to Totila, the city was forced to surrender for lack of supplies. Fortunately, Totila limited himself to the elimination of the Isaurian garrison and the destruction of the city walls. The period of Gothic rule came to an end in 552 with the death in battle of Teia, Totila's successor, on the lower slopes of Vesuvius. Naples surrendered to the Byzantines, who now seemed set to sally forth once again to make conquests in the interior, but who found their way barred by the Lombards. This barbarian tribe had begun invading Italy in the second half of the 6th century; yet, although their occupation spread from north to south, their conquests remained piecemeal and inland. They were long covetous of Naples and the links with the sea which the city offered, but there was undoubtedly the additional attraction of taking what was now the most important port in southern Italy. We thus find the southern part of the country divided, as has so often been the case in history, between foreign powers, with the church in the middle. That the Byzantines were, in a sense, the returning Roman Empire, did not make them any less foreign, as the Eastern Empire had by now developed into a culture of its own with distinct 'Byzantine' characteristics developed from its separate geographical, religious and cultural position. The effect of this in Naples was that the Greek language began to thrive once again, probably living side by side with Latin. Greek churches and monasteries were set up and there is some evidence that churches were built so that Greek and Latin masses could be held side by side. The translation of texts from Latin into Greek and vice versa gave cultural life to Naples even if it was not a development of a distinct, creative, cultural force in terms of production. The illumination of texts and miniatures is is also thought to have flourished though few examples have survived and those that have are difficult to determine as 'Neapolitan' or otherwise. The administration of Naples changed under the Byzantines and—although partly military based, as one would expect given the precariousness of the Byzantine hold on the Italian mainland—included change in the civic infrastructure and a growing importance in the role of the bishop. These changes were particularly noticeable under the rule of the Eastern Emperor Justinian (emperor from 527-565)—an important figure in the reuniting of East and West. The importance of the city gave additional status to the ruling clerical class and this led to conflict with the church of Rome, especially where the Lombard problem was concerned. The continued resistance of Naples was of particular importance to the Popes for the protection of the Papal Territories. It comes as no surprise, therefore, to find the Popes willing to come to the aid of Naples when, for example, in 592, two Lombard Dukes allied to attack the city. On this occasion, aid amounted to little more than moral encouragement for the Neapolitans to keep up their resistance, but the Lombard attack broke down upon the stout walls of the city, anyway. Papal aid, in particular that given by Pope Gregory, helped sustain the city through some thirty years of Lombard aggression whilst, within the city walls, there gathered an ever-growing number of refugees from the Lombard conquests of Acerra, Nola, Nocera and other localities. It is possible that the sacrifices and degree of solidarity necessary to keep the barbarian hordes at bay, plus the continual association with the Popes, helped instill in Naples a growing sense of independence, which would eventually lead to a disassociation from Constantinople and the establishment of an independent Duchy. One of the first signs of this was the Neapolitan rebellion of 615 which, although, quickly suppressed, led to further turbulence. Ironically, fuel to the fire of autonomy may have come from Constantinople itself when, under Constant II, the Byzantines took various Italian territories from the Lombards and, at the Emperor's request, nominated one Basilio, a Neapolitan born and bred, as the Duke of Naples. The year was 661 and is often considered the turning point in Naples' dependency on Constantinople despite the following period of Byzantine rule. Thus, from the middle of the 600's to the middle of the 800's a Byzantine Naples alternated with an independent Naples, with each change weakening the hold of Constantinople. During this period, Naples developed into the main port for African and Spanish wares on the way to Rome. The ties between Rome and Constantinople grew steadily weaker. In the 750's the Lombards took Ravenna. The Pope turned north to the Franks for help. Pepin, King of the Franks (and Charlemagne's father), retook the territory, but gave it to the Papacy, not back to Byzantium. This was the so-called Donation of Pepin, the beginning of the Papal States, a sizable chunk of territory in the middle of the peninsula, which served as an effective barrier to Italian unity for over a thousand years. It was also the beginnings of what would become known as the Holy Roman Empire, formally proclaimed in 800 with Charlemagne as Emperor. As an empire, it scarcely outlasted him, dissolving into separate kingdoms through disputes over succession. This cooperation between the Papacy and the Franks, however, shaped the future of the continent: it shifted the power to the north by maneuvering the Byzantine Empire out of northern Italy and set the stage for the formation of the future patchwork of nations which would be called "Europe," cementing in place a social, political and economic division between north and south that exists to this day. Meanwhile, the independent Duchy of Naples in the 8th century extended from Lago Patria to Amalfi. The cities of Amalfi and Sorrento had declared themselves independent and were swiftly becoming successful seafaring trading centers on their own. Naples now found itself in a very precarious position. Lombards, as always, were at the eastern gates, and the coastal waters were patrolled by the newest member of the cast, the Moslem Arabs, pretty much free to do as they wished in the absence of any Byzantine sea power. The Arabs had also just invaded Sicily and the island would be entirely in their hands by 902. In the first half of the 800's, the Lombards waged a series of bitter attacks in an attempt to take the city of Naples. The Neapolitans turned to the Arabs, who had already taken the island of Ponza and were using it as a base from which to raid the mainland. The Arabs helped Naples hold off the Lombards; in return, the Neapolitan fleet a few years later helped the Arabs take the city of Bari on the Adriatic, which remained a Moslem stronghold for thirty years. By 836 there was an alliance between the Arabs of Palermo and Naples. Naples' assistance to the Arabs weakened Byzantine sea power in the Tyrrhenian sea at a crucial time, and the Arabs were thus able to carry out their successful raids on the Aeolian islands and elsewhere along the coast. By now (840), the Byzantine Empire was so weak even in the south, that it had to call on the Franks for help against the southern Lombards. Naples resisted any attempt by the Franks to move into the city and succeeded in setting up their own Sergio, Duke of Cuma, as the Duke of Naples. This was the beginning of a truly independent Duchy. In spite of Naples helping Moslem forces take Bari in 841 and Messina shortly thereafter, Arab freebooters continued their interference with Neapolitan commerce and became intolerable. Naples formed an alliance with Amalfi, Gaeta and Sorrento to defeat the Moslem pirates, forcing them to abandon Ponza, and in 846 a united Campanian fleet helped to thwart the Arab invasion of Rome. These altercations, however, did not prevent these same Campanian sea cities from developing friendly commercial relations with Arab Sicily a few years later. Sergio II, who ruled as Duke of Naples from 870 to 877 was said to have turned the city "into another Palermo, another Africa". He was excommunicated by Pope John VIII. The Arabs were finally pushed off the mainland by a combined Byzantine and Holy Roman Empire force. Except for the anomalous case of Lucera, a Moslem settlement on the Adriatic which survived into the 13th century, the last Arab stronghold on the mainland was near Naples, a cove of pirates at Garigliano. It was wiped out in 915 by a joint Holy Roman Empire, Byzantine, Papal, Neapolitan and Gaetan force. For Naples the rest of the 900's are full of wars with Lombards and ever-persistent Byzantines. Naples continued to ignore Byzantium, but as late as 956 Constantinople managed to seize the city by force and hold it for a while. By the 1000's the Normans had arrived. In 1059 Robert Guiscard became a Papal vassal, and his younger brother Roger built a Norman state out of largely Beneventum holdings in the South. By 1076 Amalfi had accepted Norman rule. Because of commerce generated by the Crusades, the Campanian cities soon were overshadowed by Pisa and Genoa as the great international trading centers of the Christian West. In 1090 the Norman conquest of Sicily was complete. By 1100 the days of the Byzantine Empire and Islam in the Tyrrhenian Sea were through, and in 1130 Roger II, "the Norman", crowned king of Sicily, claimed Naples. He entered the city in September 1140, incorporating it into the Kingdom of Sicily. With that, Naples and Southern Italy shifted inexorably out of the orbit of the classical world of southern Mediterranean cultures and into the "European" one of the future.